One of the best-kept secrets about Alaska is our amazing microbreweries, and the award-winning concoctions the brewers are coming up with. The Mat-Su Valley is home to some remarkable microbreweries as well, as Arkose Brewery in Palmer, Last Frontier Brewing Company in Wa silla and Denali Brewing Company in Talkeetna are garnering attention around the state for their ales, lagers and more. Under the shadow of Mount McKinley, Denali Brewing Company has grown tremendously in just three years, and in a few weeks, customers will be able to buy canned versions of their favorite DBC brews from retailers. Nothing makes the long winter nights of Alaska more bearable than a pint of Twister Creek IPA! On Friday (Sept. 21), Denali Brewing Company is hosting its first "beer dinner" at Twister Creek Restaurant. They are pairing some of their classic brews, as well as others from around the state, with amazing food choices that highlight Alaska food - reindeer, locally made cheeses and meats. The following day, Saturday, Sept. 22, they are hosting their first Beer Fest in Talkeetna, to raise money for the Northern Susitna Institute. Many of their beers, as well as handcrafted beers from other Alaska microbreweries, will be on tap at the Sheldon Community Arts Hangar. It&apos;s a must-do event for beer enthusiasts. Arkose is also getting into the beer dinner mix. On Oct. 6, the small Palmer brewery will celebrate one year of operation with a dinner at Rusty&apos;s in Palmer, again mixing fantastic local brews with award-winning food choices. Your best shot at sampling brews from all local breweries, as well as from those around Alaska, is on Oct. 19-20 at the Mighty Matanuska Brewfest, a great event held at Raven Hall on the Alaska State Fairgrounds. It&apos;s a great alternative to the much-crowded beer festival held in Anchorage in January. 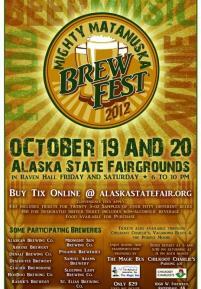 Check out these Web site for more details (www.denalibrewingcompany.com www.arkosebrewery.com www.alaskastatefair.org).